﻿The most exciting part of the entire building process is choosing the finishes. I had a very good idea of what I wanted before I stepped in the design center after looking at other homes the builder had for sale and other communities models. I might have been a bit of a home stalker, but it completely paid off in the end. Let's start in the kitchen! The kitchen is going to have these white cabinets with the glass uppers and that hood. I love, love, love that hood! Mine will have a little different trim on the bottom. The lower cabinets will be white, but the island will be gray. 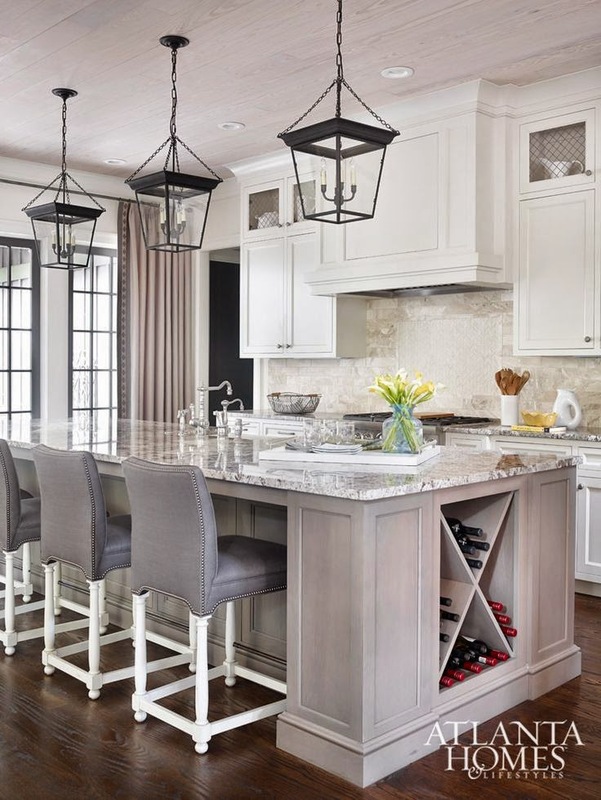 I know we've all seen white kitchens with gray islands, but let's take a look at one for kicks. 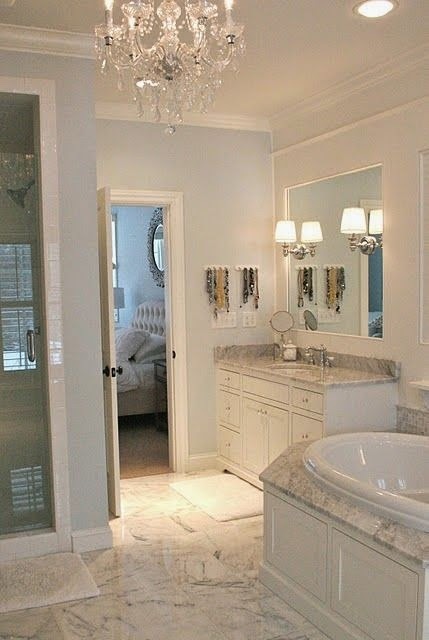 The next big decision was the master bathroom. I was so excited to find a porcelain tile that looks exactly like the marble countertop sample. The tile will be a rectangular 12x24 size instead of the square in the picture. It will be on the floor and the walls of the shower. The hard part was choosing a grout color. I immediately thought I would want white, but it looks too white against the tile. I ended up choosing gray grout. I never imagined grout colors would be my Achilles heel in this entire process. 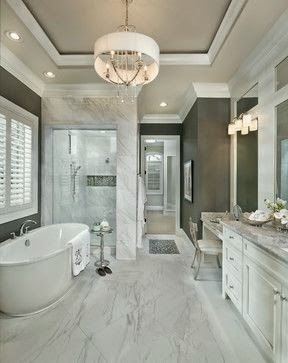 I am not thrilled about the mosaic tile below for the tub surround, but it's such a small area that I didn't want to spend a fortune on more marble. You would think because it's such a small area it wouldn't be inexpensive. Nope! Here is a close up of the gray and white grout samples next to the tile. The white looks fine in the picture, but it really is much brighter in person compared to the tile. I'm considering painting the walls a dark gray if we have enough natural light to offset all the white. The cabinets will be white and the countertops are going to be marble. The guest bathroom and powder room are also going to have the finishes as the master bathroom. Yes, more marble! On to the boys bathrooms. There will be no marble in here! All three boys will have their own bathroom and I decided to go with the same finishes in each one. It's easy and there will be no fights over who has the best bathroom. The cabinets will be white to offset the slate gray floor and dark gray granite counters. I chose an inexpensive standard tile for the shower since the shower curtain will cover it anyway. 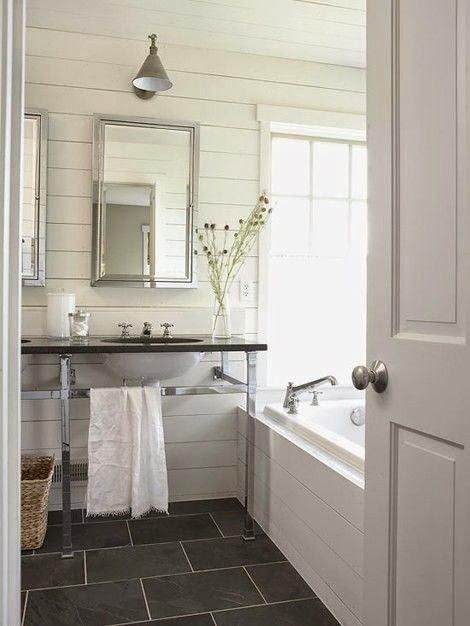 I can make each bathroom a bit different with the wall color and accessories to go with their rooms. 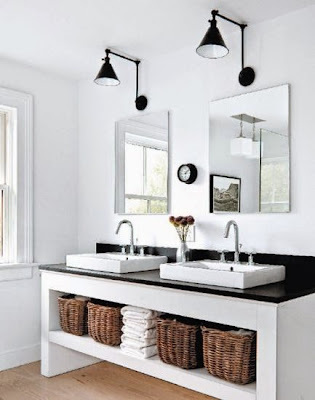 These are my favorite lights for above their vanities, but I found so many I like that I might choose a different one for each of their bathrooms. I made a last minute switch at my second visit to the design center when it came to the flooring. I had initially chosen an engineered floor after finding out the wood tile I love so much was way out of our price range. I had mentioned I would love stained on site floors to the design consultant and she mentioned the narrower boards were about the same price as the engineered floor. Here are the two floors side by side. I love the way the real wood floor on the right looks with the gray kitchen island cabinet. I was told the narrower boards would be better with the humidity in our area. The wider boards have a tendency to buckle so I'm feeling a bit better about choosing the 2 1/4". There are so many other little details we chose that I love as much as the big decisions. The front doors, the fireplace and the beams are details I can't wait to see be installed. We have a while before that happens. It's all sawdust, dirt and rusty nails right now. It's still exciting and it finally looks like a house now. I can't wait to show you the building progress next! Can't wait to see it all come together, months from now. I bet you can barely stand the wait. Congrats on the new home. Oh my, that kitchen is a show stopper! I cannot get tired of white and grey kitchens. the hood and those cabinets, oh and you said marble counters wow! I love all of your choices! How exciting and at the same time stressing, the picking of all those material might be! Loving everything you've chosen! The gray grout will make a real statement - so much more interesting than the white, I think.